Here are some memories from the 2017 Rally. Thanks to all who shared their photos. 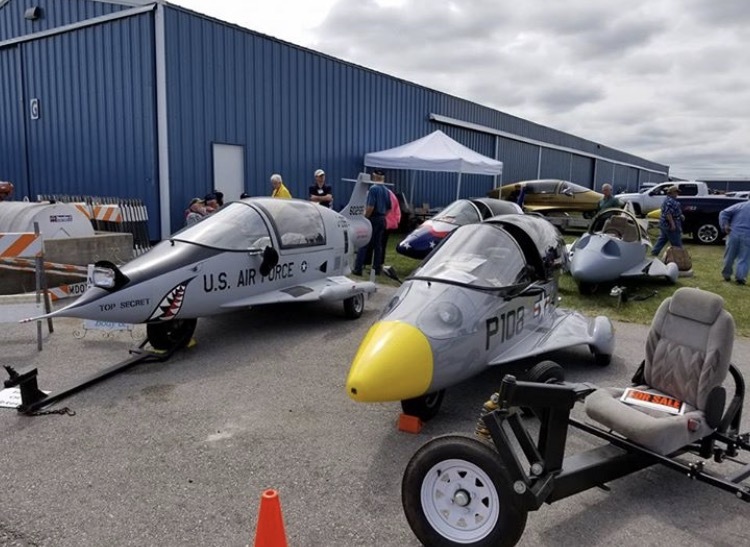 The 19th annual gathering of the Litestar/Pulse Owner’s Group started this year on Friday September 1st and included many of our regular attendees as well as a nice mix of new members to make for a wonderful weekend. People started arriving on Friday morning at the Comfort Suites hotel in Marion, Indiana. 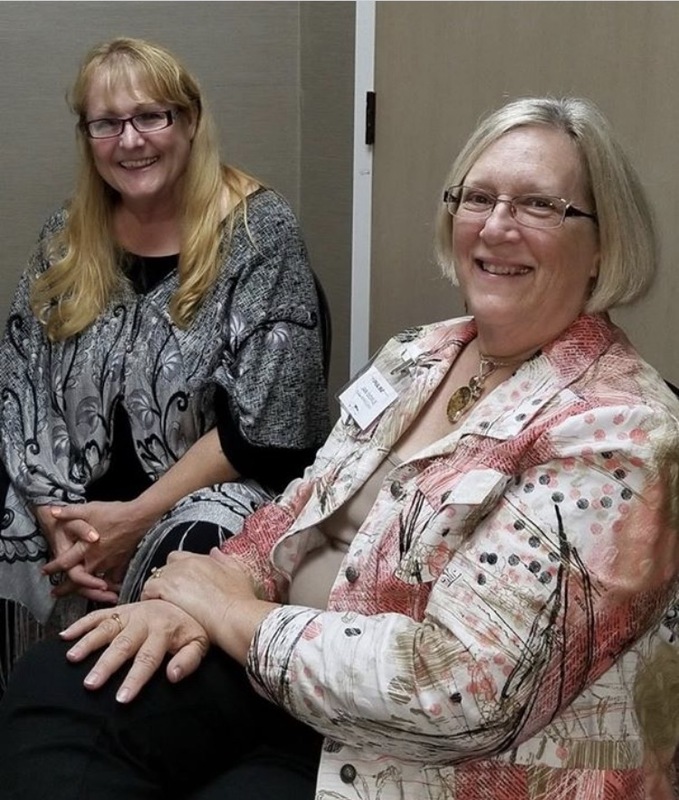 The hotel’s hospitality room was buzzing as group members gathered to see old friends and meet new Pulse owners to share their Pulse stories and catch up on personal news of friends and family since last year. 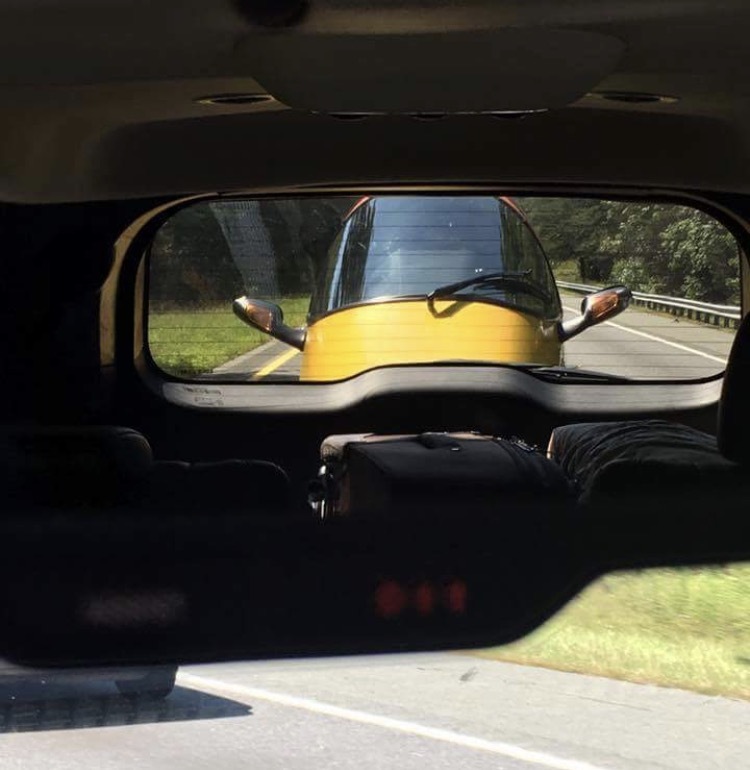 There was some discussion about law changes regarding Cabin Enclosed Motorcycles, as some states have deleted the requirement to wear helmets and now only require a basic operator’s permit “without” a motorcycle endorsement. That was great news for Hoosiers and Buckeyes and showed a hopeful positive trend for other states in the upcoming year. 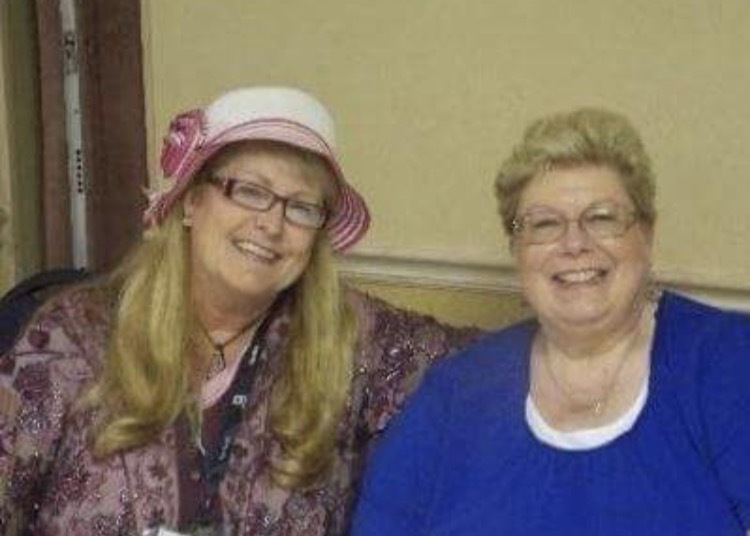 In the evening,we joined each other in the back room of the Sirloin Stockade that had been reserved for our group for dinner. At 7:00 PM we returned to the Comfort Suites Hotel hospitality room for snacks, libation and good conversation. There was no lack of any of these three on this weekend! 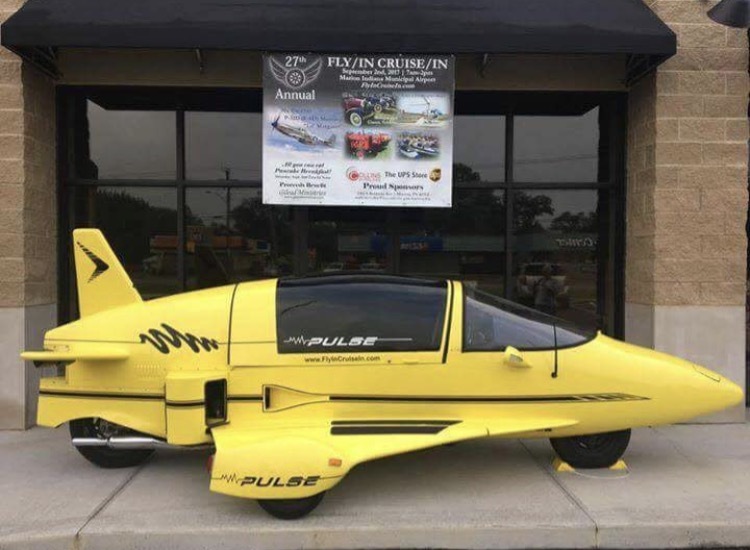 Saturday September 2nd at the Marion Municipal Airport, our group was met with an incredibly brisk 52 degrees at 7:00 AM.Winds were out of the northeast at approximately seven miles per hour with an excellent visibility of 10 miles. (Perhaps hurricane Harvey had something to do with the clear skies!) By 8:00 AM there were scattered clouds starting to block the sun and by 10:00 AM, it was completely overcast. The breeze, although light, made it feel much colder than 52 degrees. The temperature never rising above 65 degrees didn’t block the spirits of the attendees, who enjoyed coffee and huddled under blankets for warmth. 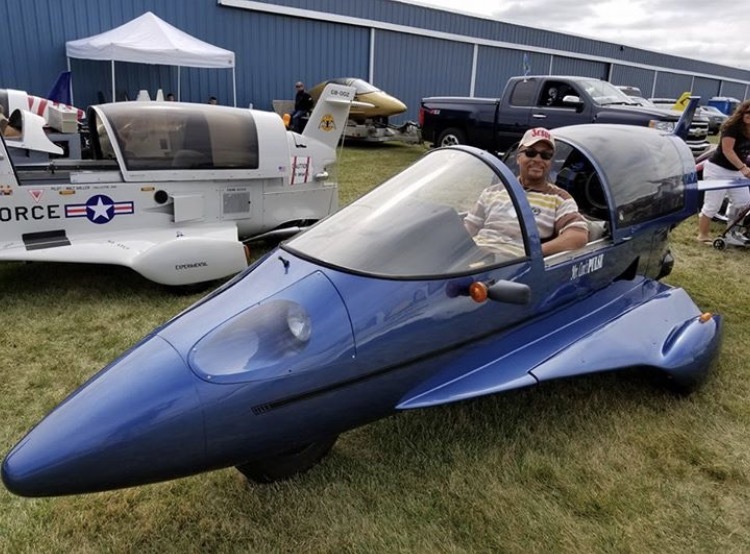 Despite the temperature and the threatening weather from Hurricane Harvey, a total of 14 autocycles were on static display at the Fly/In Cruise/In at the Marion Airport Saturday. Several Pulse owners positioned their vehicles the previous evening, after dining at the Sirloin Stockade in Marion. 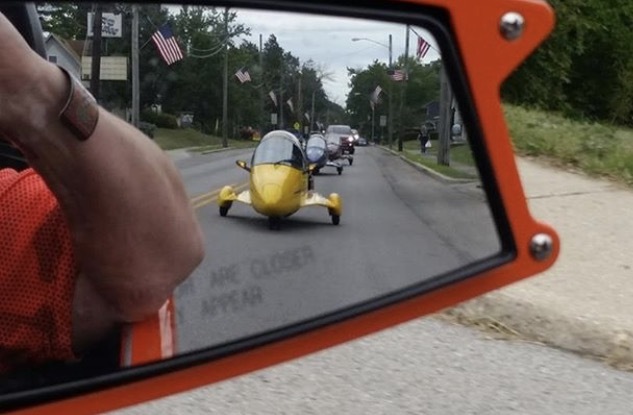 As always, there was keen interest by the public in viewing these strange vehicles. 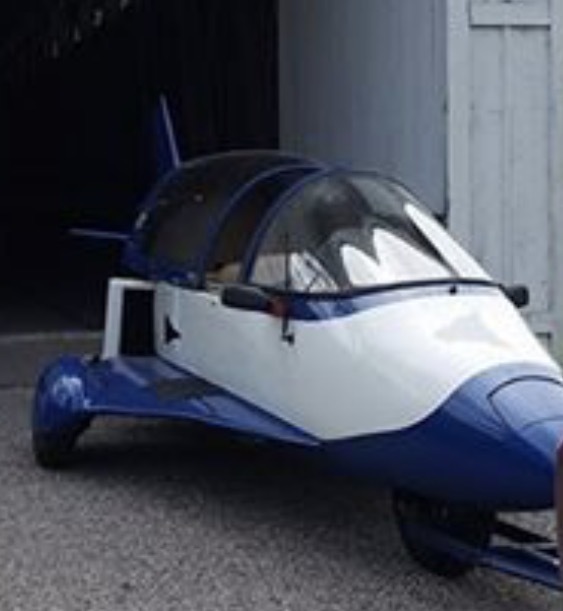 The ageless old queries of, “Does it Fly?” and “How fast will it go?” were the most frequently asked questions. “What would you take for one of those contraptions?” was also at the top of the list. 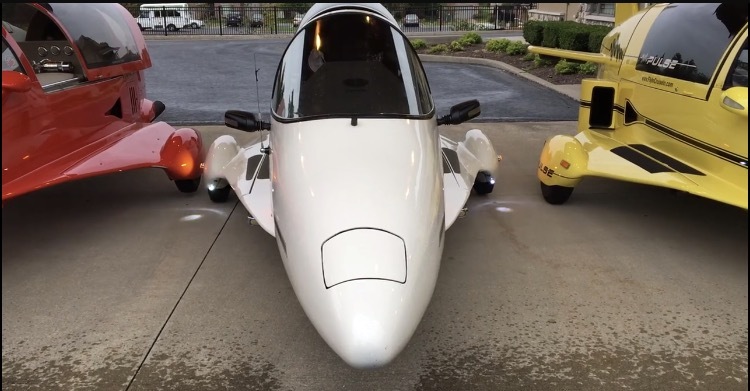 Adults and children alike marveled at these ‘Back to the Future’ limited production vehicles. 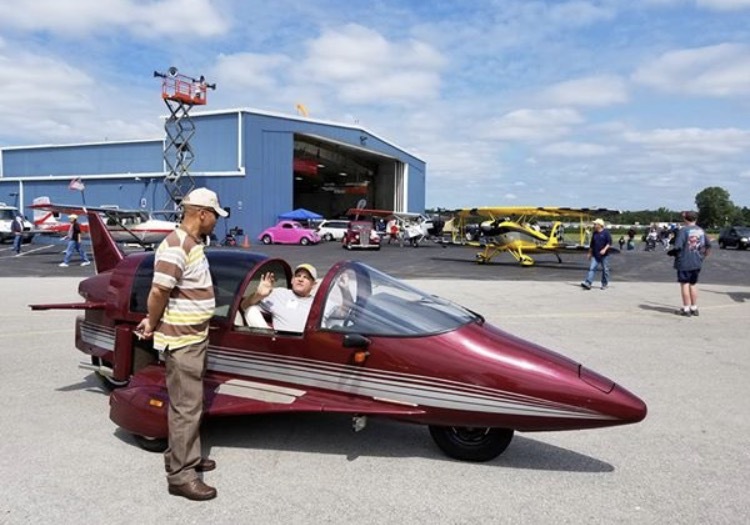 The Fly/In Cruise/In at the Marion Airport on Saturday was a success as usual. The number of total people seemed to havedecreased a bit from last year but decent weather and the opportunity to contribute to the cause for cancer, kept the overall numbers up for the Fly/In Cruise/In’s airport activities. The pancakes were endless at the breakfast and the sausages warm and the Gilead Ministries running the pancake breakfast did a great job of keeping the lines moving. 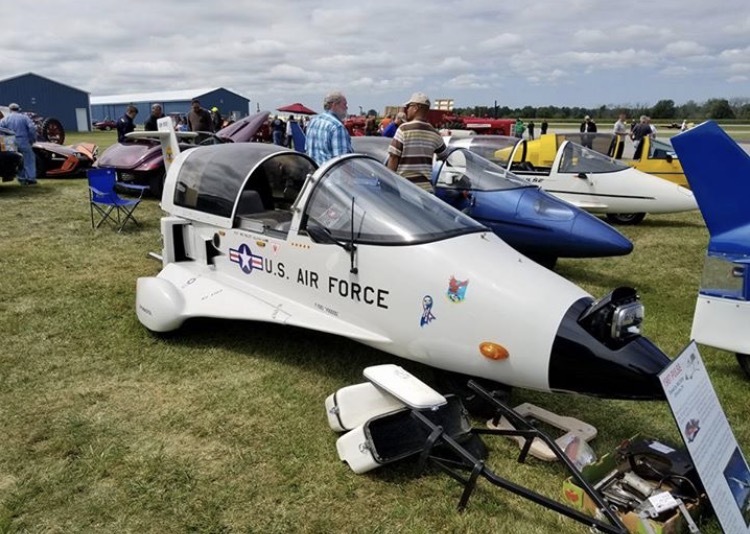 The collection of tractors, motorcycles, airplanes, helicopters, tractors, and vintage cars was a big draw as well as the helicopter and airplane rides provided. 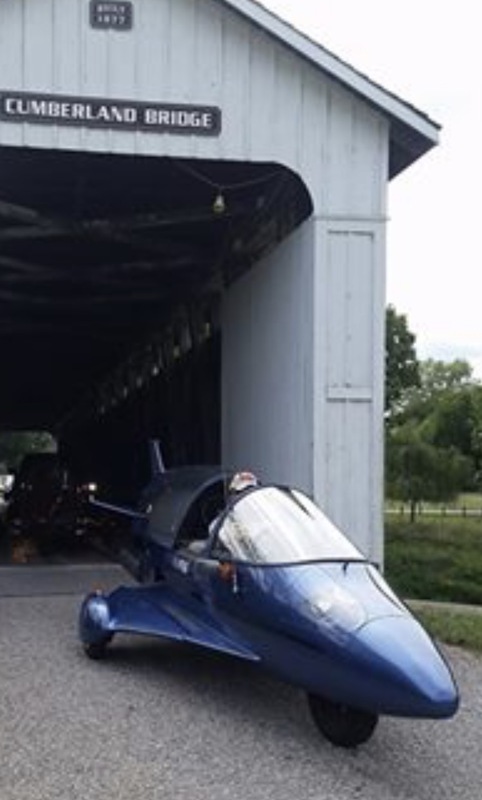 This year one of the new attractions at the Fly/In Cruise/In was the Polaris Slingshots. 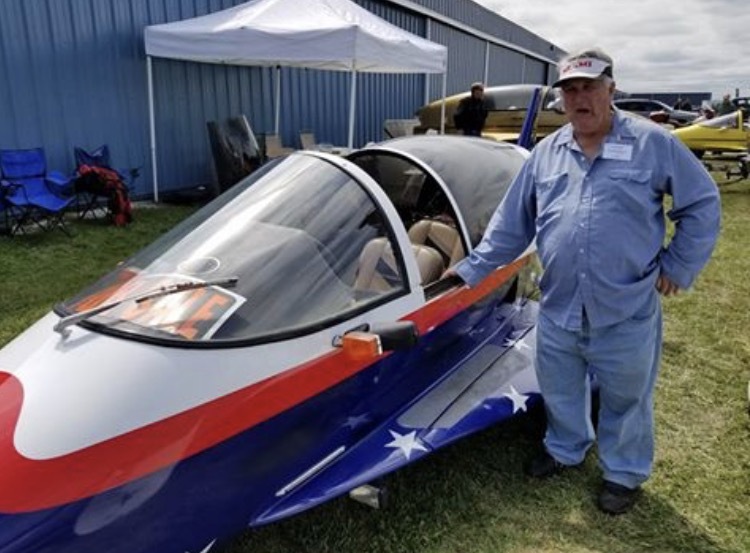 The 15 Slingshots of the Midwest SS Riders on static display drew quite a crowd. 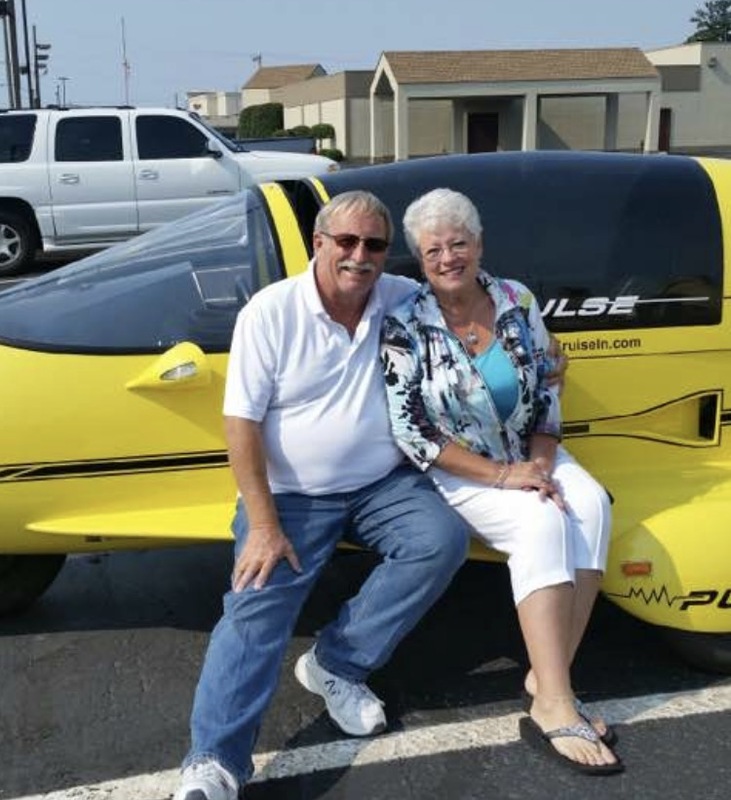 After a delicious homemade barbecue lunch at Ray and Judy Johnson’s hangar, the Litestar/Pulse Owner’s Group had their first ever poker run. 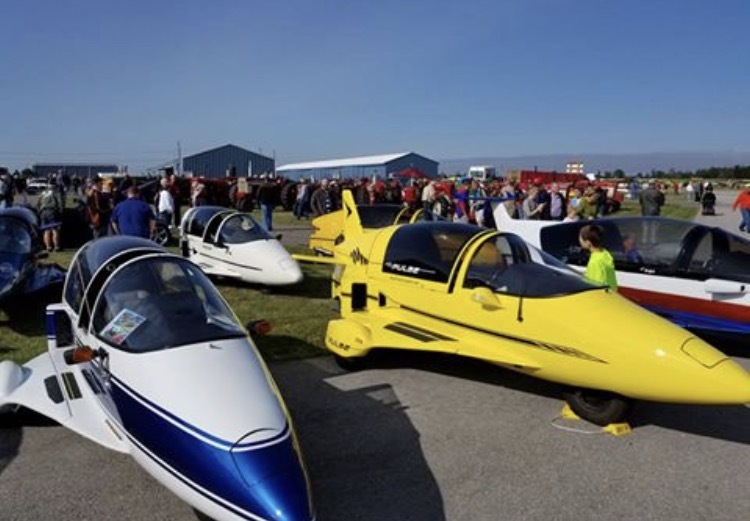 The poker run started at the Marion Airport, with the first stop at the Gas City Park and Petting Zoo. 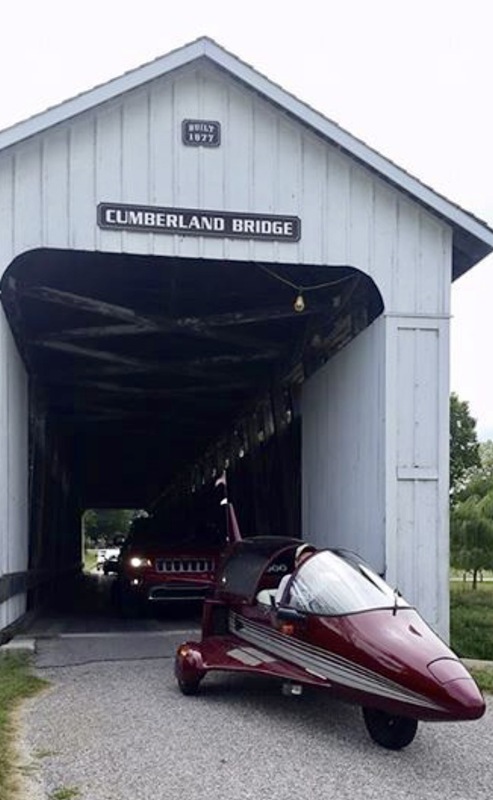 From there, the group headed to the Cumberland Covered Bridge in Matthews, Indiana. The historic bridge provided the perfect photo op for our participating members. Next stop was the Upland Train Depot Park, Upland, Indiana, followed by a stop at the Marion National Cemetery for military veterans. 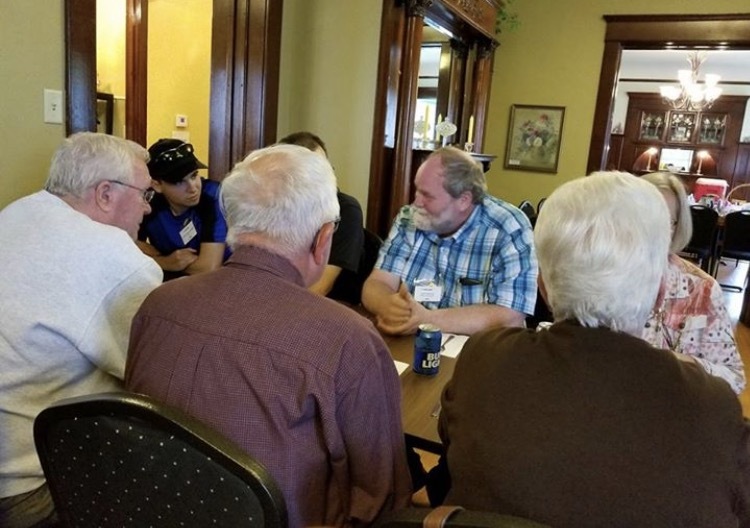 There was an additional planned stop at the Mississinewa Dam in Marion, but time began to run short so the group opted to return to the Comfort Inn for the final card draw. Brendan Minert was the winner of the poker run, holding a Flush. The Saturday dinner was catered by Peace’N Plenty at the Thompson Ray House inGas City. A few special awards were passed out and door prizes finished the evening. 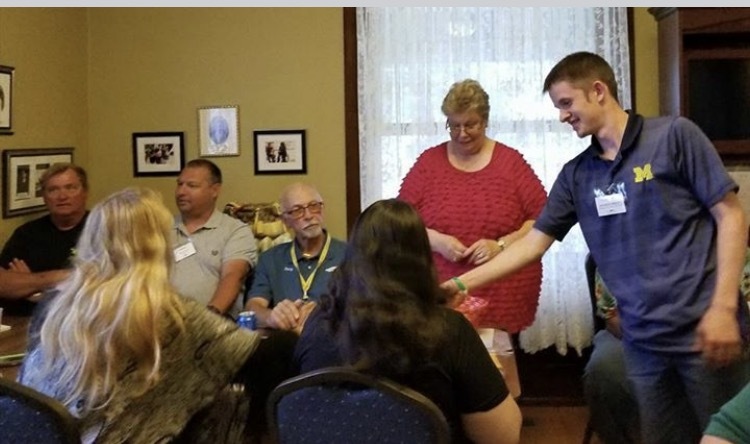 The pulled pork, Salisbury steak, corn, mashed potatoes, green beans and varied desserts made for a very satisfying evening.After dinner, the group returned to the hospitality room of the Comfort Suites for the maintenance clinic hosted by Dave Bauer. He gave an excellent power point presentation on the restoration of his Pulse. Outstanding slides and great explanations kept the crowd interested for nearly two hours. All in attendance felt it was really well done and that they walked away with some new information. On Sunday, James Dean was the theme for the day. The first stop was at the farm home of Marcus Winslow, the cousin of James Dean. Marcus grew up with James Dean and was able to shower us with stories about his experiences with the famous actor from Fairmount. We were delighted by the private tour of his personal car collection and of the numerous pieces of James Dean memorabilia he had acquired over the years. A stop was made at the grave of James Dean and another opportunity for a photo op was taken. The next stop was at the Fairmount Museum where an incredible collection of James Dean memorabilia was on display. Fairmount is obviously proud of their forever 24 icon. Lunch was at El Metate Mexican Grill and Bar where a single table (made of several tables) allowed the entire group of 30 participants to be seated together. It was a great place to dine and although a few of our members received their meals late, the restaurant did its best to wait on the group hand and foot. Several patrons were given an opportunity for a close-up look at the Pulses by our members, and many passers-by stopped in for a look as well. 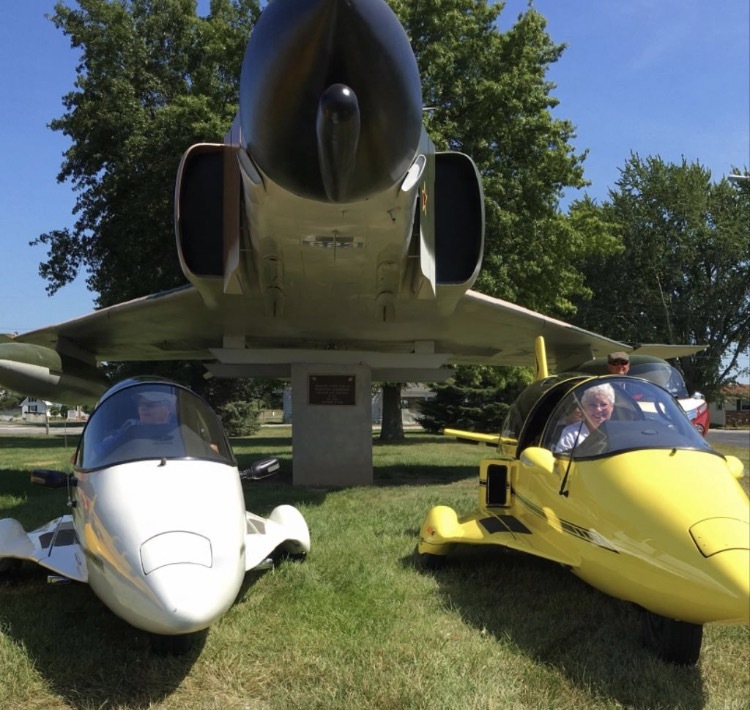 A photo shoot was held at the Fairmount American Legion in front of the F-4 Phantom that had just been painted the week before. The historical fighter jet made an excellent backdrop for the Pulse group photo. 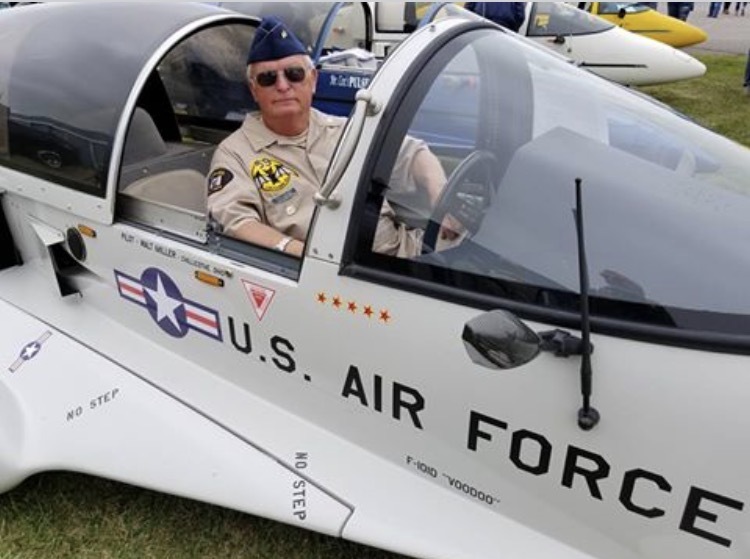 The bartender came out to greet the group and explained that the fighter plane displayed, was flown by his cousin and another townsman flew the Huey helicopter that was also on display. Lastly, the group cruised to the James Dean Gallery where many more James Dean items were exhibited as well as memorabilia from the 50’s. This second museum is free and is supported by souvenir sales. 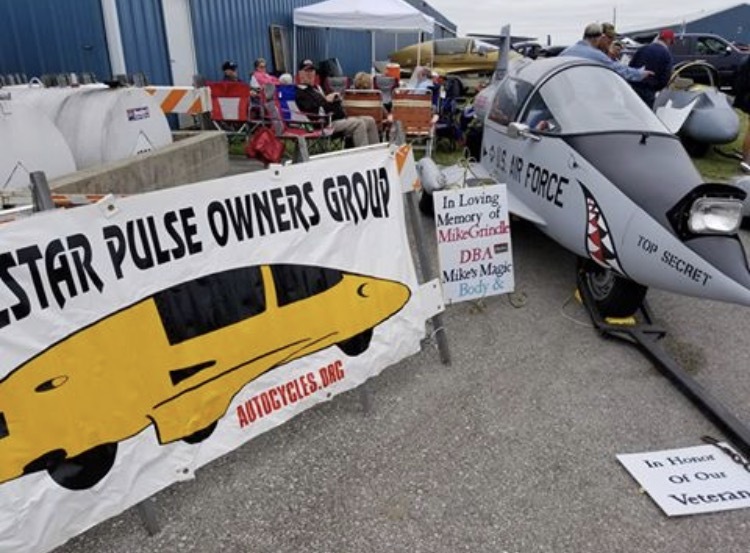 The stop was well worth the visit and the Pulses were proudly on display in front for the holiday passers-by to easily catch a glimpse of the participating autocycles. The day’s trip was topped off with a catered dinner by Fazoli’s. Spaghetti and meatballs, lasagna, baked chicken parmesan, tortellini alfredo, bread sticks, salad and brownies for dessert, quelled the group members’ hunger. Libation from the hospitality room made the Italian dinner all the more pleasurable. Monday morning brought many tears as all said ‘Bon Voyage’ until next year. A reminder was given to all to reserve next year’s rooms now. The rate went up two dollars for next year, now $77.00, a great price for an always sold-out weekend. Thanks to Royce Ann & Cindy for a great job this year! 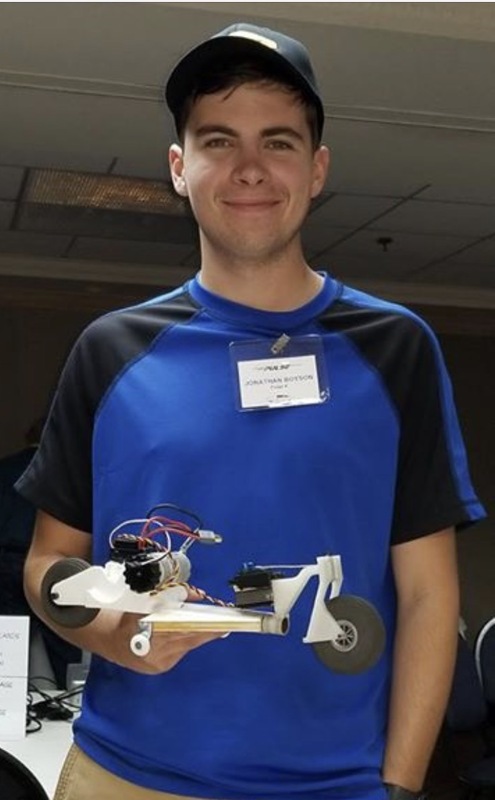 Jonathan Boyson with his Pulse model. 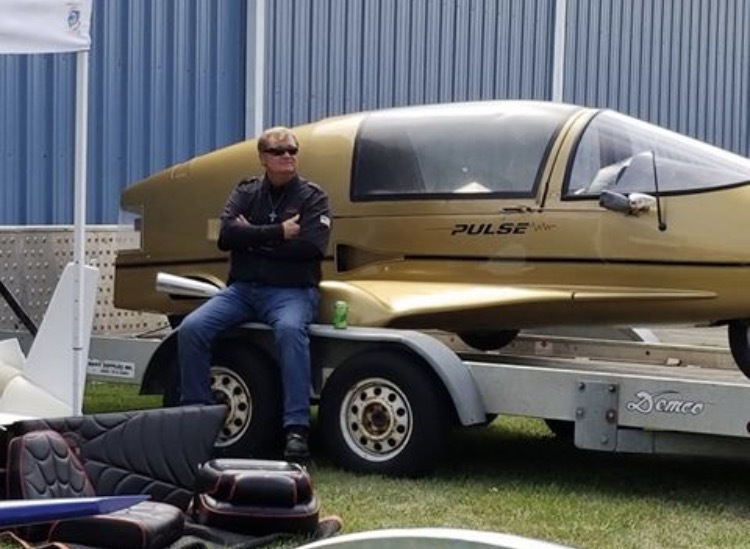 Jonathan was at the 2001 Pulse Rally in Owosso, Michigan.